Editor's note: There are two photos associated with this press release. Bullfrog Power, Canada's 100 per cent green energy provider, and SolarShare, a pioneering solar co-operative that allows Ontario citizens and businesses to invest in community-based solar energy installations, announced that the biggest solar co-op project in Toronto is now generating clean, renewable electricity. The Goodmark project, located on an 18,000 sq. ft. rooftop in Rexdale, is the latest SolarShare project and was completed in partnership with Bullfrog Power. The partnership announced in late 2012 provides critical construction-phase financing to several SolarShare projects. Goodmark is the 20th SolarShare installation in Ontario and has a system capacity of 100 kilowatts. Bullfrog Power-through its Bullfrog Builds Renewable Accelerator program-is among a small group of strategic partners supporting the capital-intensive development phase of SolarShare renewable energy projects. With the successful completion of the installation, SolarShare will raise community investment through its Solar Bonds from co-op members. Investors earn a competitive 5% return on 5-year bonds and so far they have collectively raised an impressive $2 million from 500 members. According to SolarShare President, Mike Brigham, "Community participation is the crucial difference between Goodmark and the typical Ontario renewable energy project. 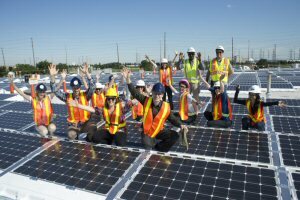 Citizens who are eager to promote green energy but may not have the means or the rooftop to install their own projects can pool their resources and finance community projects, earning a financial return from project revenue." Co-op participation in small-scale, decentralized renewable energy projects has been shown to increase local acceptance and demand for further development. "Seeing the Bullfrog Power and SolarShare communities come together is what Bullfrog Builds is all about-supporting the development of new renewable energy projects that people can see in their communities," said Josephine Coombe, Vice President, Sales and Marketing, Bullfrog Power. Join the bullfrogpowered community online-follow us on Twitter (@bullfrogpower), like us on Facebook (facebook.com/BullfrogPower). 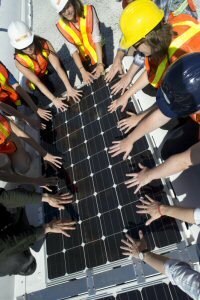 SolarShare develops solar power projects across Ontario and offers securities in the form of bonds to its members to invest in the project portfolio. SolarShare currently has over 500 members and 20 projects representing 880 kW of installed solar power generation capacity. Incorporated in January 2010, SolarShare is a not-for-profit co-operative formed by TREC Renewable Energy Co-operative. Learn more or become a member at www.solarbonds.ca. Staff and members of SolarShare and Bullfrog Power representatives at the Goodmark solar project in Etobicoke, Ontario.